Prague is an extremely mystic and romantic city. It is also known to be a city of lovers and entertainments as well as a phantom cloister and business center. In one word, Prague is a city of contradictions which has unique atmosphere and constantly attracts a large number of tourists. Some people jokingly compare Prague with Hermitage since they consider that life will not be enough to see all the sights without any exception. There is an element of truth in it. If you get to know Prague exclusively within the frameworks of excursion programs, your vacation time will not be enough for you. Therefore, when going to Prague, it is necessary to think of hiring a car. Many people are afraid of renting a car since they reckon it to be extremely difficult and troublesome. For all intents and purposes, it is not true! It is nowadays possible to take care of car rental beforehand by means of leaving an application on an extremely reliable service bookingcar.ru. You will manage to book a car without any problems spending very little time. In case you are a disciplined driver who knows the international road traffic regulations, you will not experience any difficulties. The road traffic regulations are standard, the signs are international and information tables are translated into English. However, some general information, which will help the driver of a rented car in Prague, will undoubtedly be useful. In most cases, the policemen in Prague are extremely welcoming and benevolent. That is why a driver must be polite as well. If you are stopped for committing some offence, it is recommended to feel sorry and express profound repentance. This is the best way to get the minimum sum of fine. It is strongly not recommended to demand your rights. If you offend a policeman, he can simply deprive you of a driving license and send to court. There are definite speed limitations on the territory of Prague as well as on the whole territory of Czech Republic. Always follow the speed rate since the policemen often make ambushes with speed guns. You are also recommended to follow the roads signs since the speed rate can change on some parts of the road. The maximum speed within the limits of Prague can be 50 km/h. The maximum speed allowed outside the city is 90 km/h. It is possible to accelerate to not more than 130 km/h on express roads. If the weather is bad, be especially careful. In case the road visibility is less than 50 meters, the speed must not be more than 50 km/h in all cases. It is possible to park a car at this place for not more than 2 hours. The cost of one parking hour is 1.5 Euro. It is allowed to park a car for up to 6 hours at this parking space. One parking hour will cost you 1 Euro only. You are not allowed to park a rental car at these parking lots. These lots are earmarked for company cars as well as for city inhabitants. The city guests do not have a right to park cars here. There are a large number of parking lots on the outskirts of Prague. These lots are also affordable. In work time, one parking hour costs not more than 0.5 Euro. On weekends and at night, these parking lots are free. There are special machines for accepting payments near all lots. Do not forget to place the parking voucher under the windscreen of your car! The blood alcohol level, which is up to 0.03 permille, brings about the imposition of a fine whose size is from 100 to 500 Euro as well as the deprivation of a driving license for up to one year. In case the blood alcohol level is more than 0.03 permille, the sum of fine increases up to 5000 Euro, and the disqualification term will be up to 10 years. Such strict sanctions are probably the reasons for it being very difficult to see a drunken driver on the roads of Prague. It is allowed to carry all children, whose height is more than 150 cm, in special booster chairs only. It is absolutely not important how old a child is. The main thing is his or her height. In Prague, the drivers must always remember about the necessity to turn the dim light on. The dim light shall burn 24 hours per day, 7 days per week and 365 days per year. Concerning fog lamps, they must not burn without a necessity. Only in case of bad visibility inclusive of fog is it allowed to turn fog lamps on. There are very many fuel stations inclusive of gas stations within the limits of the city. The quality of fuel is very high, and the prices are similar at all fuel stations. That is why you can bravely fill your car with fuel at any of them. The price for one liter of diesel fuel is 1.36 Euro. Follow the fuel level in the tank since it is prohibited to carry fuel in cans. 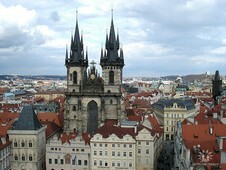 Czech Republic from 16 eur a day.